Matthew Broderick stars in the indie film To Dust as Albert, a community college biology professor, who embarks on an unlikely friendship with an Hasidic cantor, distraught by his wife’s death. To Dust directed by Shawn Snyder opened in theaters on Friday February 8th in NY, with nationwide rollout to follow. Shmuel, a Hasidic cantor in Upstate New York, is distraught by the untimely death of his wife, Rivkah. As he struggles to find solace in his religion, which proffers a stringent timeline for grief, Shmuel grows increasingly haunted by visions of Rivkah’s decomposing corpse. Convinced that her soul will suffer until her body returns to dust, Shmuel decides that to stop his feverish spiral he must seek an understanding of the physical processes of her decay – despite the blasphemy inherent in any scientific inquiry. Risking discovery and expulsion, Shmuel tip-toes outside his enclave, where his search leads to Albert, a bumbling biology professor at the local community college. 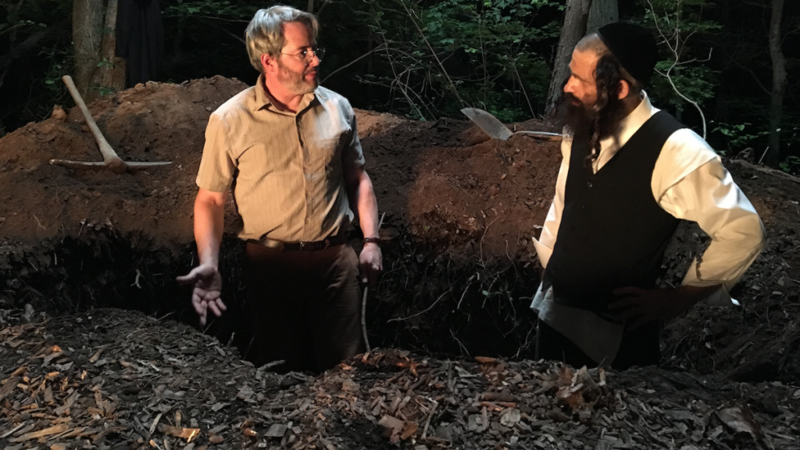 Soon, Albert is unwittingly seduced into an odd world of homespun forensic research and begins to guide Shmuel through outrageous experiments that aim to approximate a timeline for Rivkah’s dissolution – starting with the theft, suffocation and burial of a pig. As amateur scientists practicing imperfect science and incompetent criminals on progressively absurd outings, the two find themselves neck-deep in genres in which neither of them belongs. With their macabre moonlit misadventures growing ever more perilous, the odd couple will stop at nothing to satiate their curiosity and ultimately find Shmuel the comfort he desperately seeks.